The dollar, Washington Irving wrote in 1837 at the height of a financial panic, is “daily becoming more and more an object of worship.” This saying is a useful reminder that the national monetary icon has never been simply an economic issue; it has also always been a cultural issue. 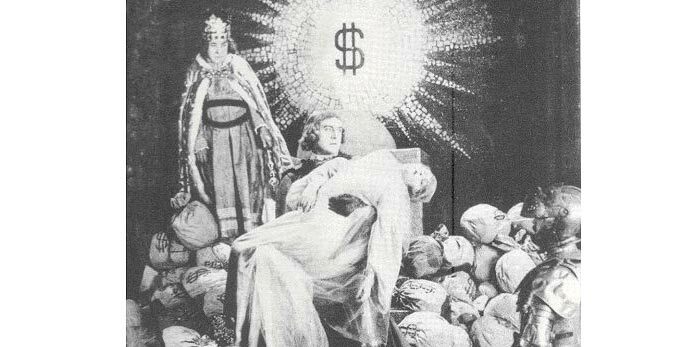 We therefore invite proposals for papers that consider people’s engagements with the “Almighty Dollar,” from the most ordinary, mundane daily practices to the most extra-ordinary, life-changing ones. Since such engagements can be found in literature, the arts, film, and popular culture, the possibility of topics is wide open, so long as they connect to the meanings of and the increasingly thin line between the dollar and the people who make, use, and consume it. We look forward, then, to proposals from a wide variety of disciplines including, but not limited to, culture studies, literature, history and art history, political science and sociology, economics, communication studies, popular culture studies, folklore, anthropology, gender studies, and race studies. We encourage and wish to present a multiplicity of theoretical frames and methodologies that grapple with questions concerning the cultural work of the national monetary icon. A selection of papers will appear in a conference volume, to be published by LIT-Verlag as part of the American Studies in Austria series. Marc Shell (Comparative Literature, Harvard University). The conference, while hosted by Alpen-Adria-Universität Klagenfurt, will meet in Velden am Wörthersee, with the “Casineum” as the main venue. Velden am Wörthersee is one of Austria’s premier relaxation and bathing resorts and famous for architectural marvels such as the Baumgartner Villas in the “Wörthersee architecture” style, and the renaissance Velden Palace built in 1590. The Palace, the Promenade, and the Casino invariably have been used as film settings. Velden am Wörthersee is located in the southern part of Austria, between Klagenfurt, the capital of the state of Carinthia and home to Alpen-Adria-Universität Klagenfurt, and Villach, a major junction city and the gateway to Europe’s south and southeast. © 2008 Austrian Association for American Studies.